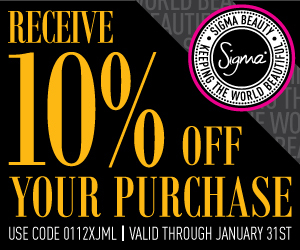 Just simply visit Sigma, select your items and then at the checkout enter the code: 0112XJML to receive 10% off your entire purchases! The code is valid until 31st January 2012. I definitely recommend their makeup brushes they are excellent quality yet, great value for money and far more affordable than MAC and they come beautifully wrapped so would make a perfect gift. Have you tried Sigma Brushes? I also would like to see more aromatherapy diffusers on sale in the market today as I'm starting a boutique of different scents and I wish to buy them in bulk.